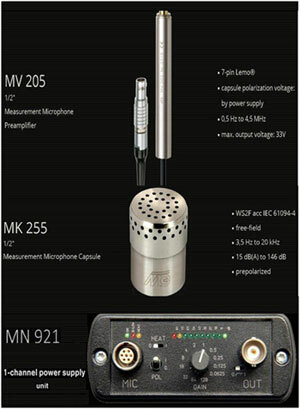 Microtech Gefell: The MV 205 is a high-impedance converter for externally polarized 1/2" capsules in weatherproof measurement microphone units for sound level measurements with a dynamic range of 11 dB - 168 dB. The low output impedance allows high dynamic range even with long connection cables. Controlled heating prevents possible condensation under extreme climatic conditions. The A 63.1 adapter can be used to operate externally polarized 1" capsules and the A 67 adapter can be used to operate externally polarized 1/4" capsules. The capsule connection complies with the international standard IEC 61094. The preamplifier is suitable for sound level meters (class 1 according to IEC 61672). The MV 205 can be optimally combined with the new MK 255 stainless steel capsule and the MN 921 power supply unit. MK 255 - 1/2" measuring microphone capsule made of stainless steel (including diaphragm). The MK 255 is designed for research, development and industry, including building acoustics and audiometry. A fixed charge carrier layer (backelectret) provides the necessary polarization voltage. The constructive concept guarantees high temporal constancy of the electroacoustic parameters. The counter electrode (carrier of the electrets layer) is isolated from the housing by a quartz glass pane. The protective cap protects the membrane from mechanical damage. The MN 921 is a 1-channel power supply for measuring microphones with a precision amplifier with variable gain is connected. It adapts the dynamic range of the measurement signal to the dynamic range of the subsequent evaluation unit. When switched on (button on the rear of the instrument), a green LED on the front indicates that the internal operating voltage is available. The power supply unit generates all necessary voltages for a condenser measuring microphone (preamplifier operating voltage, polarization voltage and, if necessary, heating voltage / power supply optionally by batteries, accumulators or mains). These voltages are completely galvanically isolated (no mains hum in the output signal) and available at the LEMO socket (MIC). The output for the operating voltage (120 V) is short-circuit-proof, the polarization voltage is precisely regulated to ± 0.1 V. For permanently polarized measuring microphones, the polarization voltage can be switched off.